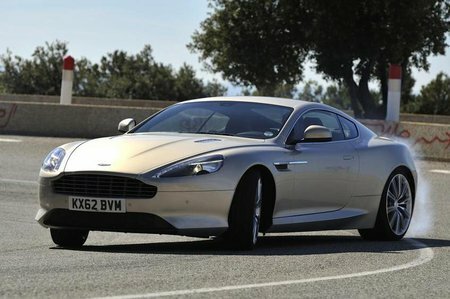 What's the used Aston Martin DB9 coupe like? Replacing the pretty DB7 was always going to be hard, but it could be argued that the Aston Martin DB9 is even more striking. An all-new car, with the exception of the V12 engine, it produces 450bhp, giving 0-60mph in 4.8sec. Inside, you'll find a mostly bespoke interior, which does away with the old Ford-sourced switches. Everything feels modern and dynamic; the dashboard is matt wood and aluminium, while the rest of the cabin is leather and carpet. The DB9 is at its best on flat, smooth A-roads, where it is composed and grippy. It becomes unruly on anything bumpier, and the ride is on the sharp side of firm, even on the motorway. The rear seats are okay for children on very short runs, but realistically there's no usable space in the back, so this is essentially a two-seater. The boot is also very small and the 200-mile range of the fuel tank may frustrate you.